Introduction Insulin analogues have become increasingly popular despite their greater cost compared with human insulin. The aim of this study was to calculate the incremental cost to the National Health Service (NHS) of prescribing analogue insulin preparations instead of their human insulin alternatives. Methods Open-source data from the four UK prescription pricing agencies from 2000 to 2009 were analysed. Cost was adjusted for inflation and reported in UK pounds at 2010 prices. Results Over the 10-year period, the NHS spent a total of £2732 million on insulin. The total annual cost increased from £156 million to £359 million, an increase of 130%. The annual cost of analogue insulin increased from £18.2 million (12% of total insulin cost) to £305 million (85% of total insulin cost), whereas the cost of human insulin decreased from £131 million (84% of total insulin cost) to £51 million (14% of total insulin cost). If it is assumed that all patients using insulin analogues could have received human insulin instead, the overall incremental cost of analogue insulin was £625 million. Conclusion Given the high marginal cost of analogue insulin, adherence to prescribing guidelines recommending the preferential use of human insulin would have resulted in considerable financial savings over the period. Insulin analogues have become increasingly popular in recent years. Insulin analogues are more costly than their human insulin alternatives. The aim of this cross-sectional study is to calculate the incremental cost to the National Health Service (NHS) of prescribing analogue insulin preparations instead of their human insulin alternatives. If all dispensations for analogue insulin between 2000 and 2009 had used a human insulin alternative, the NHS would have saved an estimated £625 million. Given the high marginal cost of analogue insulin, adherence to prescribing guidelines recommending the preferential use of human insulin would have resulted in considerable financial savings over the period. The calculation of the incremental cost of analogue insulin was based on an assumption that the same volume of insulin would be prescribed if patients were switched from analogue to human insulin. Some data were missing from the Welsh Prescription Cost Analysis (PCA) and had to be estimated using PCAs from alternative countries in alternative years. This cost was adjusted for inflation and was unlikely to have impacted on the estimates as a whole as the net ingredient cost and volume of these products was small. PCA only includes information on how much insulin was dispensed and not how many prescriptions were collected by patients with type 2 diabetes. There is no definitive figure on how many patients with type 2 diabetes could have received human insulin instead of analogue insulin. Open-source data from the four prescription pricing agencies for England,15 Northern Ireland,16 Scotland17 and Wales18 were used in this study. The Prescription Cost Analyses (PCAs) for England, Northern Ireland and Wales describe the quantity and NIC of all NHS prescriptions dispensed in primary care in the constituent country. The NIC refers to the cost of the drug before any discounts, and does not include any dispensing costs or fees.19 The PCA for Scotland specifies gross ingredient cost, which is equivalent to NIC in the PCAs for England, Northern Ireland and Wales.17 The PCAs for the four countries from 2000 to 2009 were combined. Data were grouped into insulin types according to their molecular origin (analogue, human-sequence and animal-sequence) and also into individual insulin types (insulin soluble, insulin isophane, insulin zinc suspension mixed, insulin zinc suspension crystalline, biphasic isophane insulin, protamine zinc insulin, insulin aspart, insulin lispro, insulin detemir, insulin glargine, biphasic insulin aspart, biphasic insulin lispro and insulin glulisine). For the Welsh data from 2000 to 2004, it was necessary to calculate the quantity of each type of insulin dispensed from the NIC per unit quantity from the PCAs for England, Scotland or Northern Ireland, since the Welsh PCA data did not include this information until 2005. If the drug name in the PCA did not specify a presentation, that is a phial, a pre-filled pen or a cartridge, then it was assumed to be a phial. All costs were adjusted for inflation, and they are reported in UK pounds at 2010 prices using the gross domestic product deflator published by HM Treasury.20 The incremental cost of analogue insulin was calculated by summing the NIC of analogue insulin and then subtracting the cost of dispensing the same volume of insulin of human origin. The incremental cost of analogue insulin was also calculated by assuming that if patients prescribed analogue insulin had alternatively received human insulin, they would still have received the same presentation that is, a phial, a prefilled pen or a cartridge for a reusable pen device, since patients and clinicians favour the ease-of-administration offered by pen devices.21 22 Using data from a previous analysis of all prescribing costs for diabetes throughout the UK,23 we were further able to estimate the relative volumes of analogue and human insulin prescribed by the type of diabetes. Over the 10-year period, the NHS spent a total of £2732 million on insulin prescriptions. Prescriptions for analogue insulin accounted for £1629 million (59%), human insulin £1056 million (39%) and animal insulin £47.2 million (2%). The total annual cost of insulin rose from £156 million in 2000 to £359 million in 2009, a 130% increase (figure 1). In 2000, the annual cost of analogue insulin was £18.2 million, which represented only 12% of total insulin cost, while the cost of human insulin was £131 million or 84% of the total insulin cost. Spending on analogue insulin increased from £192 million (66% of total insulin cost) in 2005, by which time all the currently marketed insulin analogues had been launched, to £305 million (85% of total insulin cost) in 2009. During the same period, the annual cost of human insulin fell from £95.3 million (33%) to £51.1 million (14%). The cost of animal insulin per year also decreased from £7.42 million (5%) in 2000 to just £3.07 million (1%) in 2009. The total annual cost of insulin prescriptions for the UK, 2000–2009. NIC, net ingredient cost. The unit cost of each insulin preparation is listed in table 1. Analogue insulin cost on average £2.31 per millilitre and was therefore 47% more expensive than human insulin at £1.57 per millilitre. In 2009, the mean NIC per millilitre was £1.27 for human insulin and £2.25 for analogue insulin. The NIC per millilitre of human and analogue insulin peaked in 2003 and 2004, respectively. Compared with 2004 values, the NIC per millilitre in 2009 had decreased by 27% for human insulin and by 7% for analogue insulin (table 2). These unit costs were used to estimate the maximum, annual, incremental cost of dispensing analogue insulin assuming that all analogue prescriptions dispensed could have been alternatively prescribed as human insulin. Assuming 100% conversion, the annual incremental cost of analogue insulin increased from £5.18 million in 2000 to £133 million in 2009 (table 3). Overall, for the 10-year period, the total incremental cost of analogue insulin was £625 million at 100% conversion and £312 million at 50% conversion. Between 2005 and 2009, the incremental cost of analogue insulin was £538 million at 100% conversion and £269 million at 50% conversion. Patients with type 2 diabetes accounted for an estimated £86.0 million of NHS expenditure on human and analogue insulin in 2000, increasing to £229 million (+166%) in 2009. For type 1 diabetes these values were £62.7 million and £127 million, respectively (+103%). Over the entire period, the total cost of insulin prescribing for type 2 diabetes was £950 million for insulin analogues and £708 million for human insulin (see table 4). The incremental cost of analogue insulin for patients with type 2 diabetes was estimated at £306 million at 100% conversion and £153 million at 50% conversion. Human insulin is more likely to be dispensed as a phial when compared to insulin analogues which are typically administered using a pen device (table 1). If all those receiving analogue insulin had been dispensed human insulin instead but the presentation had remained the same (ie, a phial, a pen or a pen-fill device), then the incremental cost of analogue insulin in the UK between 2000 and 2009 would have been £271 million at 50% conversion and £541 million at 100% conversion, compared with £625 million at 100% conversion (table 3) if insulin presentation is not take into account. Since their launch, insulin analogues have had an increasing impact on the amount of resources used to manage diabetes. The annual inflation-adjusted cost to the NHS of insulin increased from £156 million in 2000 to £359 million in 2009 (a twofold increase). During the same period, annual NHS spending on analogue insulin increased from £18 million (12% of total insulin cost) to £305 million (85% of total insulin cost), while annual NHS spending on human insulin fell from £130 million (84%) to £51.1 million (14%). If all dispensations for analogue insulin between 2000 and 2009 had used the equivalent human insulin, we estimate the NHS would have saved £625 million. The increase in the use of analogue insulin is likely to be due in part to successful marketing. Some of the manufacturers of insulin analogues also provided professional support to general practitioners at the time their analogue insulin was marketed, although this was not conditional on the doctor prescribing their insulin.14 Insulin analogues were also available in new devices that may be more appealing to patients and easier to use than the devices used to administer human insulin.14 The fact that 40% of analogue insulin was prescribed as a prefilled pen device compared with just 18% of human insulin supports this suggestion. Finally, a move to patented insulin products has notable commercial benefits for manufacturers. This study had inherent limitations. The calculation of the incremental cost of analogue insulin was based on the assumption that the same volume of insulin would be prescribed if patients were switched from analogue to human insulin. The PCA for Wales from 2000 to 2004 did not include the quantity of insulin dispensed which was necessary to calculate the incremental cost. The quantity, therefore, had to be calculated from the NIC per quantity figures from the PCAs for England, Scotland and Northern Ireland. However, certain products in the Welsh PCA were not available for the other regions for the same year, so figures from the previous years had to be used and adjusted for inflation. Some drugs were listed only under their generic name in the Welsh PCA and so a weighted-average NIC per quantity for the branded products in the English PCA was used. The same approach was taken when the drug name description did not specify whether the cartridge size was 1.5 ml or 3 ml (when these were the only cartridge sizes on the market). In addition, there were two drug names, Human Actraphane and Human Protaphane phials, which had no matches in any of the other PCAs for any year. These are Novo Nordisk products, which tend to carry the same cost per unit depending on whether they are phial, penfill or prefilled pen and which is not dependent on what type of human insulin is in the device. Therefore, the NIC per quantity used for these two products was the NIC per quantity of the other Novo Nordisk phials. These assumptions were unlikely to have impacted upon the estimates as a whole, since the NIC and the volume of these products were small. The assumption that all patients using insulin analogues could be equally well treated with human insulin is also likely to be unrealistic. Dr Adler, chair of the NICE guidance committee, has suggested that 90% of patients with type 2 diabetes could receive human insulin instead of long-acting insulin analogues, with around two-thirds of these patients remaining on human insulin.14 Currently, however, there is no definitive figure for how many people with diabetes could have received human insulin instead of analogue insulin. The purpose of this study was to calculate a monetary value to raise awareness of the cost implications at a population level of prescribing analogue insulin instead of human insulin rather than to suggest an exact percentage of patients with diabetes who could be equally well treated with human instead of analogue insulin. NHS Health and Social Care Information Centre. Prevalence Data Tables. 2010. http://www.ic.nhs.uk/statistics-and-data-collections/supporting-information/audits-and-performance/the-quality-and-outcomes-framework/qof-2009-10/data-tables/prevalence-data-tables. Department of Health, Social Services and Public Safety. Quality and Outcomes Framework Achievement Data at Local Commissioning Group (LCG) Level 2009/10. 2010. http://www.dhsspsni.gov.uk/index/hss/gp_contracts/gp_contract_qof/qof_data/primary_care-qof.htm. NHS National Services Scotland, Information Services Division. GMS—Quality & Outcomes Framework—2008/09 QOF Prevalence Data. 2010. http://www.isdscotland.org/isd/6431.html. Welsh Assembly Government, Statistics for Wales. QOF Disease Registers. 2010. http://www.statswales.wales.gov.uk/TableViewer/tableView.aspx?ReportId=24813. Diabetic-Life.co.uk. Number of UK Diabetics Increases. 2010. http://www.diabeticlife.co.uk/news/2010/Oct/number-of-uk-diabetics-increases.html. British National Formulary 60 (September). London: BMJ Publishing Group, Pharmaceutical Press, 2010.
. Nice insulins, pity about the evidence. Diabetologia 2007;50:1783–90.
. A review of human analogue insulin trials. Diabetes Res Clin Pract 2007;77:1–15. NHS Information Centre for Health and Social Care. Forty Per cent Rise in Cost and Number of Drug Items Prescribed to Treat Diabetes in England, NHS Information Centre report shows. 2010. http://www.ic.nhs.uk/news-and-events/press-office/newsreleases/forty-per-cent-rise-in-cost-and-number-of-drug-items-prescribed-to-treat-diabetes-in-england-nhs-information-centre-report-shows.
. ‘Human’ insulin versus animal insulin in people with diabetes mellitus. Cochrane Database Syst Rev 2005;(1):CD003816. Institute for Quality and Efficiency in Health Care. Rapid-acting Insulin Analogues in the Treatment of Diabetes Mellitus Type 2: Final Report; Commission A05–04. 2008. https://www.iqwig.de/download/A05-04_Final_Report_Rapid-acting_insulin_analogues_for_the_treatment_of_diabetes_mellitus_type_2.pdf. Institute for Quality and Efficiency in Health Care. [Long-acting insulin analogues in the treatment of diabetes mellitus type 2: final report; commission A05–03] (In German). 2008. https://www.iqwig.de/download/A05-03_Executive_summary_Long_acting_insulin_analogues_in_the_treatment_of_diabetes_mellitus_type_2.pdf. National Institute for Clinical Excellence. Guidance On the Use of Long-acting Insulin Analogues for the Treatment of Diabetes—Insulin Glargine. London: NICE, 2002. (Technology appraisal 53). http://www.nice.org.uk/nicemedia/live/11482/32518/32518.pdf.
. How small changes led to big profits for insulin manufacturers. BMJ 2010;341:c7139. NHS Information Centre for Health and Social Care. PACT Data for England. 2010. http://www.ic.nhs.uk/statistics-and-data-collections/primary-care/prescriptions. HSC Business Service Organisation. Prescription Cost Analyses. Health and Social Care in Northern Ireland, 2010. http://www.centralservicesagency.com/display/statistics. NHS National Services Scotland, Information Services Division. Prescription Cost Analysis for Scotland. 2010. http://www.isdscotland.org/isd/2241.html. NHS Wales, Prescribing Services. Prescription Cost Analysis. 2011. http://www.wales.nhs.uk/sites3/page.cfm?orgid=428&pid=13533. NHS Information Centre for Health and Social Care. Prescription Cost Analysis, England 2009. Glossary. 2010. http://www.ic.nhs.uk/webfiles/publications/prescostanalysis2009/PCA_2009_Glossary.pdf. HM Treasury. Gross Domestic Product (GDP) Deflators. 2010. http://www.hm-treasury.gov.uk/data_gdp_fig.htm. ; and the FlexPen Study Team. A multi-center, randomized, open-label, comparative, two-period, crossover trial of preference, efficacy and safety profiles of a prefilled, disposable pen and conventional vial/syringe for insulin injection in patients with type 1 and type 2 diabetes mellitus. Clin Ther 2003;25:2836–48.
. Assessment by patients with diabetes mellitus of two insulin pen delivery systems versus a vial and syringe. 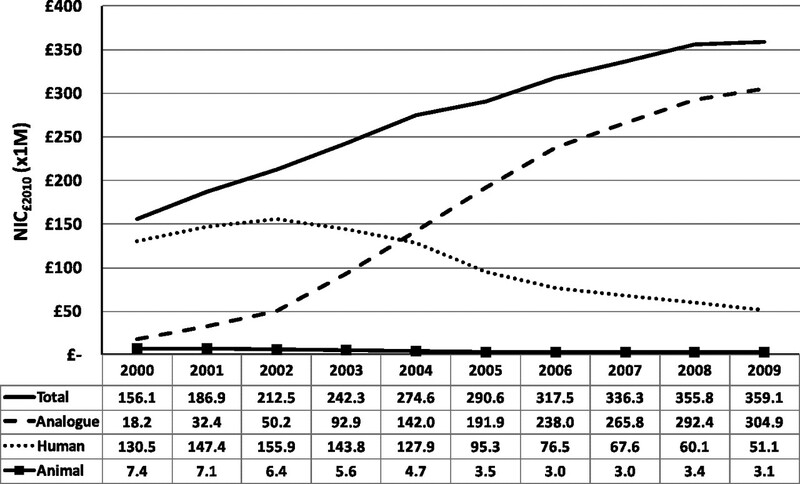 Clin Ther 1998;20:486–96.
. Estimation of primary care treatment costs and treatment efficacy for people with type 1 and type 2 diabetes in the United Kingdom between 1997 and 2007. Diabet Med 2010;27:938–48.
. Meta-analysis of individual patient data to assess the risk of hypoglycaemia in people with type 2 diabetes using NPH insulin or insulin glargine. Diabetes Obes and Metab 2010;12:772–9.
. Cost effectiveness of insulin analogues for diabetes mellitus. CMAJ 2009;180:400–7. National Institute for Clinical Excellence. Type 2 Diabetes: The Management of Type 2 Diabetes. London: NICE, 2008. (Clinical guideline 66). http://www.nice.org.uk/nicemedia/pdf/CG66NICEGuideline.pdf.
. More from PHARMAC on long-acting insulin analogues: insulin glargine now funded. N Z Med J 2006;119:118. Canadian Agency for Drugs and Technologies in Health. Insulin Analogue Therapy. http://www.cadth.ca/en/products/optimal-use/insulin-analog-therapy.
. Similar progression of diabetic retinopathy with insulin glargine and neutral protamine Hagedorn (NPH) insulin in patients with type 2 diabetes: a long-term randomised open-label study. Diabetologia 2009;52:1778–88. Hospital Episode Statistics (HES Online). Primary Diagnosis: 4 Character. 2010. http://www.hesonline.nhs.uk/Ease/servlet/ContentServer?siteID=1937&categoryID=214.
. Actrapid cartridges to be discontinued after December. Pharm J 2005;274:785.
. Mixtard 30—going, going, gone? Drug Ther Bull 2010;48:85. Diabetes UK. Diabetes in the UK 2010: Key Statistics on Diabetes. London: Diabetes UK, 2010. http://www.diabetes.org.uk/Documents/Reports/Diabetes_in_the_UK_2010.pdf. Diabetes UK. Report and Statistics. Diabetes in the UK 2004. London: Diabetes UK, 2004. http://www.diabetes.org.uk/Professionals/Publications-reports-and-resources/Reports-statistics-and-case-studies/Reports/Diabetes_in_the_UK_2004/. Diabetes UK. Reports and Statistics. Diabetes Prevalence 2009. London: Diabetes UK, 2009. http://www.diabetes.org.uk/Professionals/Publications-reports-and-resources/Reports-statistics-and-case-studies/Reports/Diabetes-prevalence-2009/.
. Prevalance of obesity in type 2 diabetes in secondary care: association with cardiovascular risk factors. Postgrad Med J 2006;82:280–4.
. 10-Year follow-up of intensive glucose control in type 2 diabetes (UK PDS 80). N Eng J Med 2008;359:1577–89.
. The changing prevalence of diagnosed diabetes and its associated vascular complications in a large region of the UK. Diabet Med 2010;27:673–8.
. Reducing cardiovascular disease risk in diabetic persons with established macrovascular disease: can insulin be too much of a good thing? Diabetes Obes Metabol. In press. doi:10.1111/j.1463-1326.2011.01468.x.
. Vasculotoxic effects of insulin and its role in atherosclerosis: what is the evidence? Curr Atheroscler Rep 2011;13:123–8.
. Insulin: potential negative consequences of early routine use in persons with type 2 diabetes. Diabetes Care 2011;34(Supplement 2):s225–30.
. The safety profile of exogenous insulin in people with type 2 diabetes: justification for concern. Diabetes Obes Metab. In press. doi:10.1111/j.1463-1326.2011.01469.x. Correction notice The “To cite: …” information and running footer in this article have been updated with the correct volume number (volume 1). Competing interests CP has received payment for lectures from Novo Nordisk; CP, CC and CM have carried out consultancy work for pharmaceutical companies that manufacture insulin. Contributors CP conceived and designed the study, CM and SH collated and analysed the data, CC, CP and SH interpreted the data, SH drafted the article and all authors were involved in the revision of the article. CC approved the final version to be published and is overall guarantor. Provenance and peer review Commissioned by the BMJ and Channel 4 News; externally peer reviewed. Data sharing statement All data used in this study were obtained from the four UK prescription pricing agencies and are open–source.